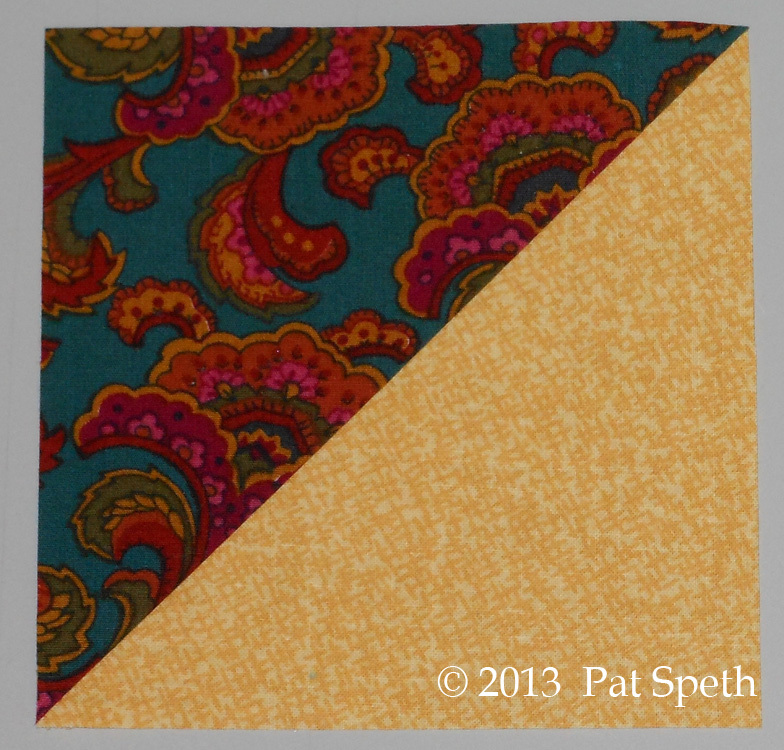 Starting with two 5″ squares; one dark and one light. 1. 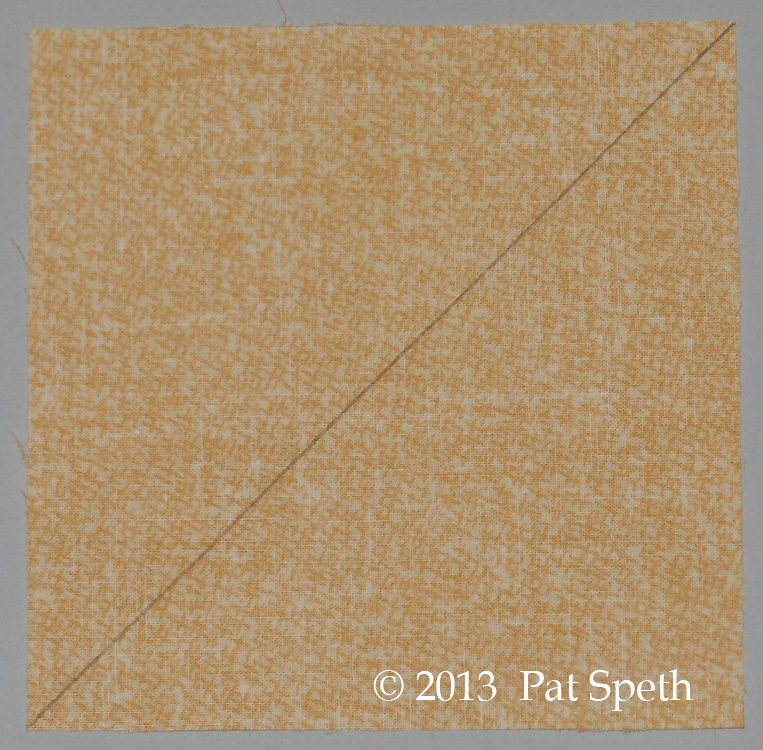 Draw a diagonal line on the wrong side of a 5″ square of background (light) fabric. 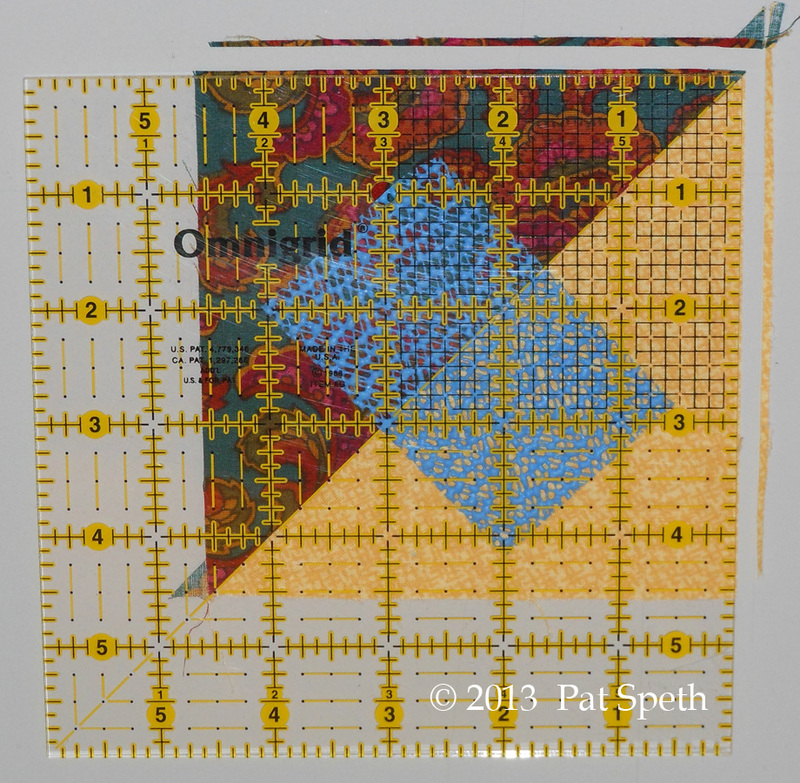 With right sides together, place the marked background square on top of a square of the main fabric. 2. 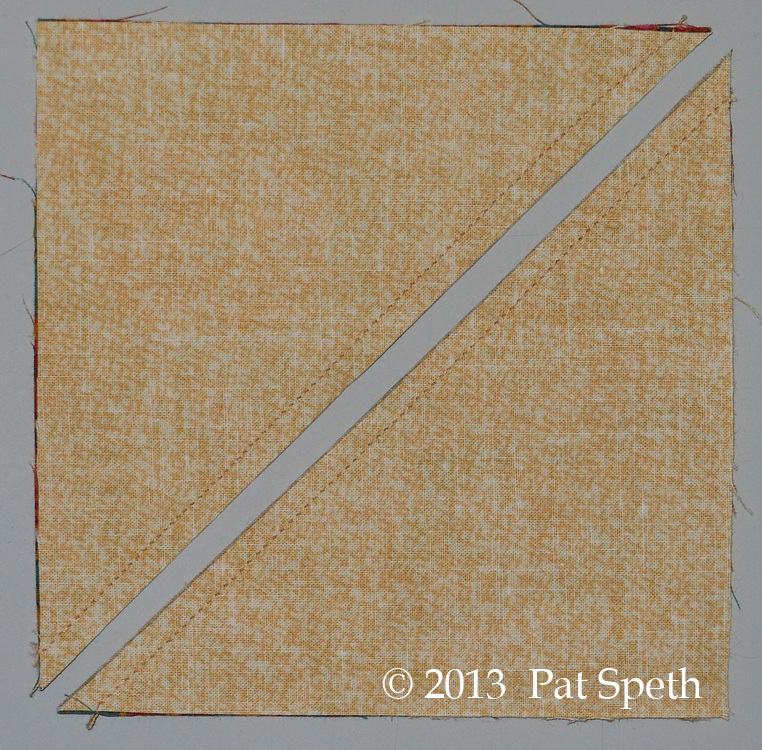 Stitch a “scant” 1/4″ wide seam on both sides of the diagonal line. I always sew my seams using a “scant” 1/4″ wide seam allowance. 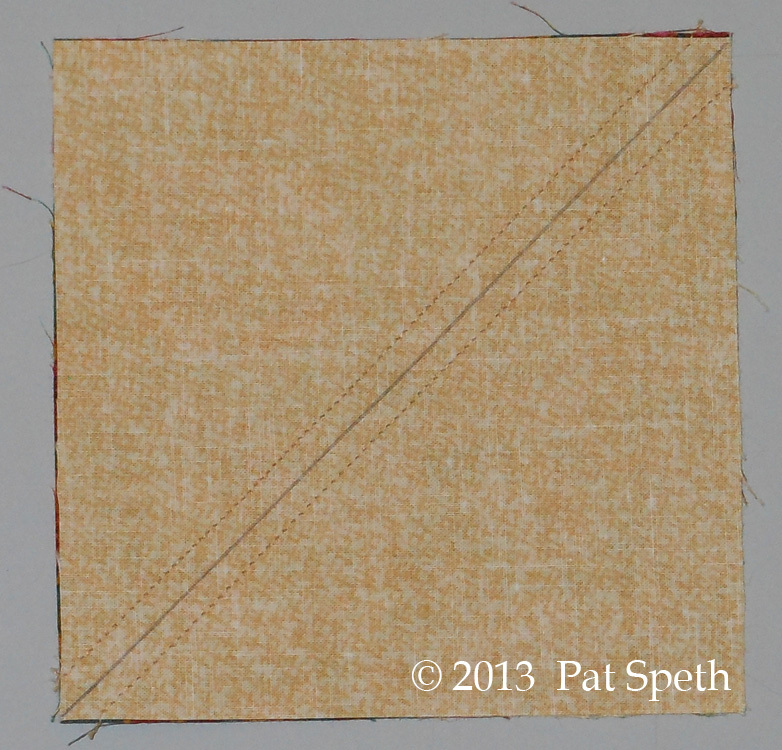 This is a slightly narrower seam, about a needle width narrower than the full 1/4″. This narrower seam allows for the thickness of the thread in the seam allowance, the pressing of the fabric over the seam, and results in a more accurately sized unit. Give it a try! 3. Cut along the diagonal line to yield two half-square-triangle units. 4. Press to set the stitching; then press the seam toward the dark fabric, unless otherwise instructed in directions for the block you are making. Next, we are going to trim the units and you will need a ruler that has a 45º diagonal line that extends to the corner of the ruler. Also very helpful is Blue Dude to keep the ruler from slipping. I place Blue Dude between the ruler and the unit. 5. To trim the units, place the 45º diagonal line of your ruler along the seam line. Position it so that the fabric extends past the ruler on two adjacent sides, and the remaining sides extend past the 4 1/2″ lines on the ruler. Trim away the fabric that extends beyond the ruler edges. 6. Reposition the unit so that the two trimmed edges now line up along the 4 1/2″ lines on the ruler and the 45º diagonal line is along the seam line. 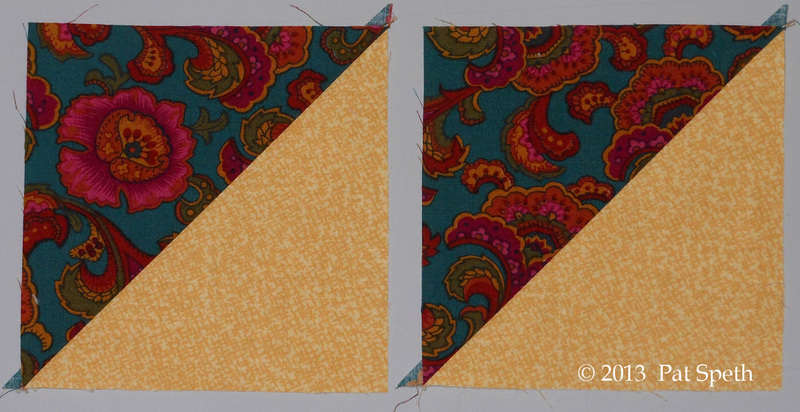 Trim the remaining two edges for a perfect 4 1/2″ half-square-triangle unit. A perfect 4 1/2″ half-square-triangle unit is a thing of beauty! 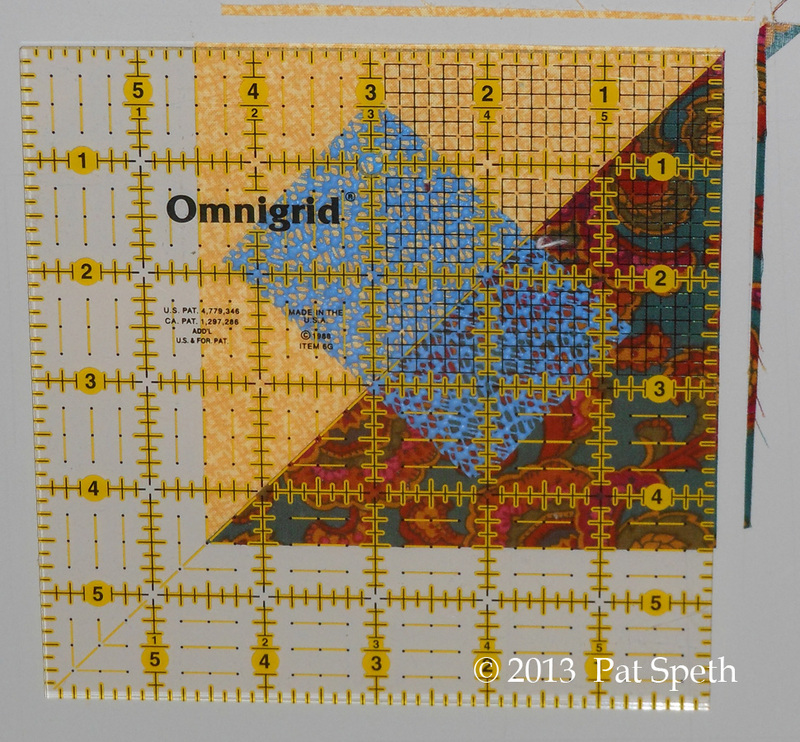 In my Half-Square-Triangle and Four Patch workshop participants can work on fifteen different quilts during the same workshop! 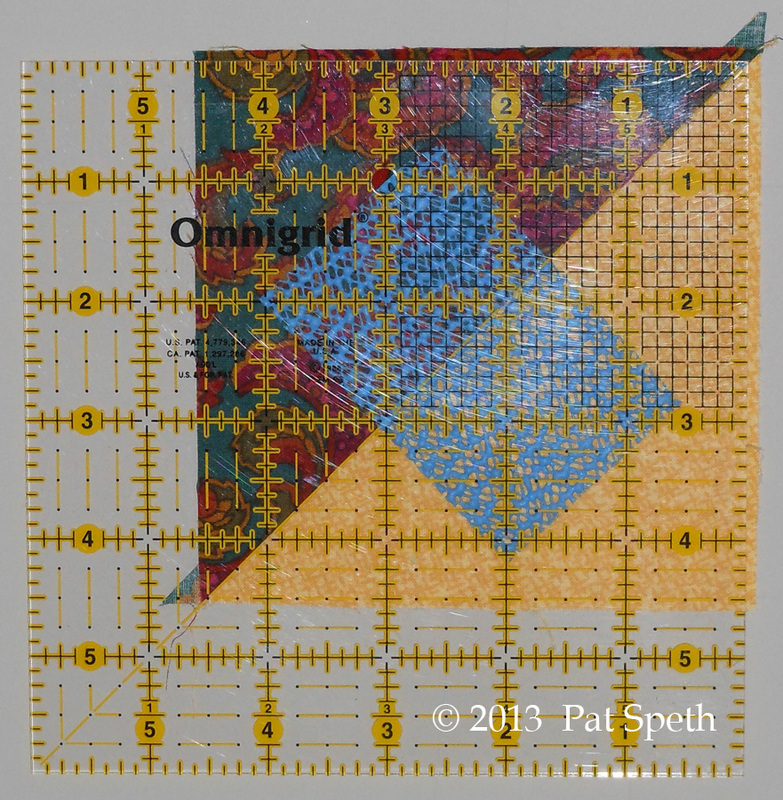 This entry was posted in Uncategorized and tagged Half-Square-Triangle, how-to, instructions, Quilt blocks, Workshops by patspeth. Bookmark the permalink. Thank you! What a great tip – I’d never heard of a ‘blue guy’ before and this looks like it WORKS. You’re fabulous – thanks, Pat! !